Blades By Conversion Industry - Find The Industrial Cutting Blades You Need! | Carolina Knife Co.
Carolina Knife Co. supports various industrial conversion industries by supplying top quality machine blades, accessories, and sharpening. Choose from a wide selection of stock blades made specifically for popular conversion equipment or request a quote on a custom blade. 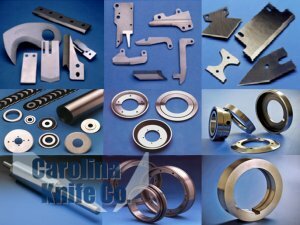 Along with manufacturing, Carolina Knife Co. specializes in industrial blade sharpening and regrinding or resurfacing hardened sleeves/rolls. Whether you purchase your blades from us or another supplier, consider getting your blades resharpened by our expert staff in industry leading turnaround times. To learn more about industrial knife sharpening services, contact our team today!